Gorgeous styles sure to make her say "Yes!" Stunning design and superb quality are the trademarks of a Romance diamond ring. From contemporary to vintage reproduction, there is a Romance engagement ring to suit any style. All styles are completely customizable! Click the image to see the full range of this gorgeous collection. Ever & Ever is a thoughtfully curated, customizable ring collection that inspires brides to create the ring of their dreams. 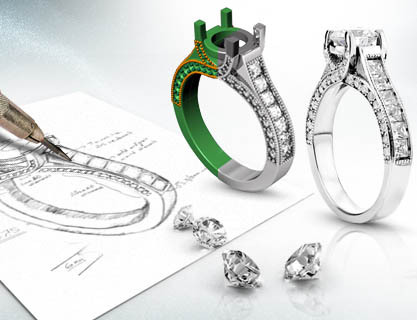 From trendy modern styles to the classics, the Ever & Ever collection offers endless options to create your dream ring. Click the image to start transforming any ring you like into a ring you'll love! The Promesa Collection prides itself on being the premier manufacturer of white gold rings that contain no rhodium plating. Rings will not yellow over time. Low maintenance Precise White Gold coupled with sophisticated styling will be treasured for years to come. Click the image to see more styles. If you dream it we can create it. Stop in to discover all the possibilities. Click the image to see examples of our custom created jewelry.